While some car enthusiasts may sneer at the very idea of having cupholders in their vehicles, those of us who drive more than 500 miles a day either regularly or infrequently feel that they're essential. During the odd hours of the night, all that might be available is a drive-through fast food joint or a highway rest area with vending machines. Getting the cup into the holder when you purchase the drink isn't a problem - after all, the car isn't moving, the interior lights are probably on, and you can devote your full attention to placing your drink in the holder. Even picking up the drink from the holder while driving isn't a problem - after all, you can fumble around with your hand until you get a grip (and hopefully a firm grip!) on the drink and pick it up. But putting it back - that's another story. The interior of the car is dark, you're supposed to be paying attention to the road, and there are all sorts of odd nooks, crannies, and obstacles in the general area of the cupholder. If you have the center armrest down, as I usually do, it gets even more interesting. You can think you have the cup in the right area, push down to seat it in the holder, and whoops - coffee or soda going places where it shouldn't. 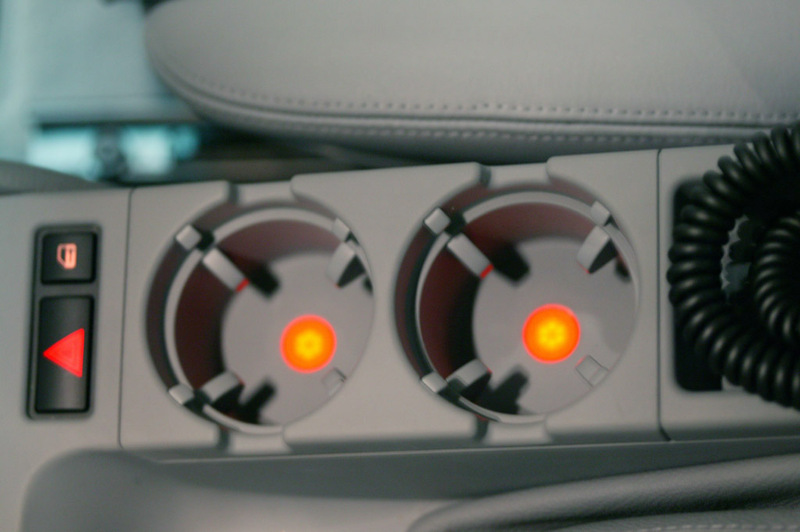 You could turn on the interior light, except you have one hand on the wheel, one holding your drink, and (unless you're from outer space or an octopus) you're out of arms for other tasks... Besides, you don't want the bright light to ruin your night vision. Some other car brands offer illuminated cupholders on their cars, and I decided this would be a good idea for the BMW 3 Series as well. 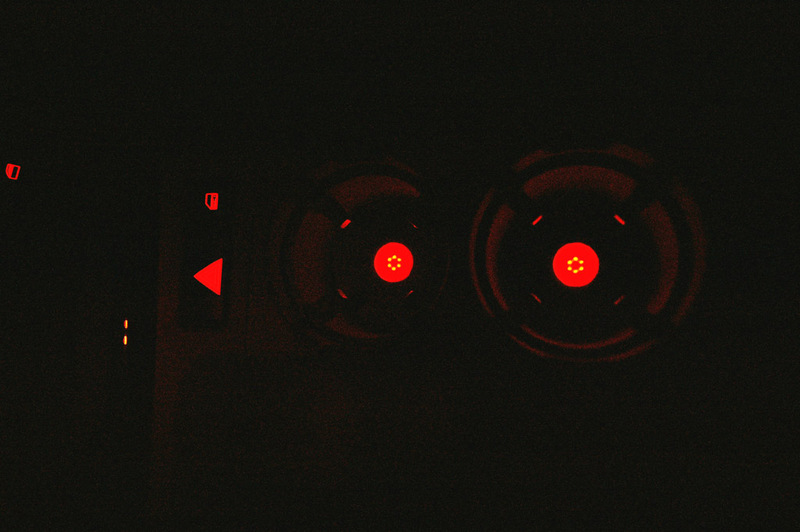 After thinking about a number of options, I decided I would install red LEDs in the bottom of each of the cupholder bins. I chose this as being as close as possible to the BMW amber lighting scheme. I wanted to have as large an area as possible lit up, so the light could be dim but still show where the cupholder was located. 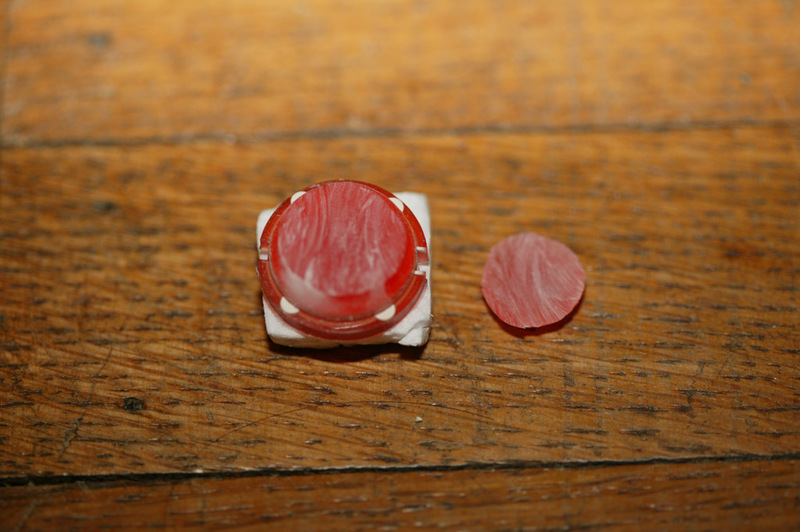 The largest available red LED that I could find was a 20mm (approximately 3/4") model, but it had a rounded top rather than the flat top that I wanted. The rounded top gives a nice diffused light, but it protrudes into the cupholder enough that a flat-bottomed drink container would wobble around, as well as placing undue strain on the LED mounting itself. 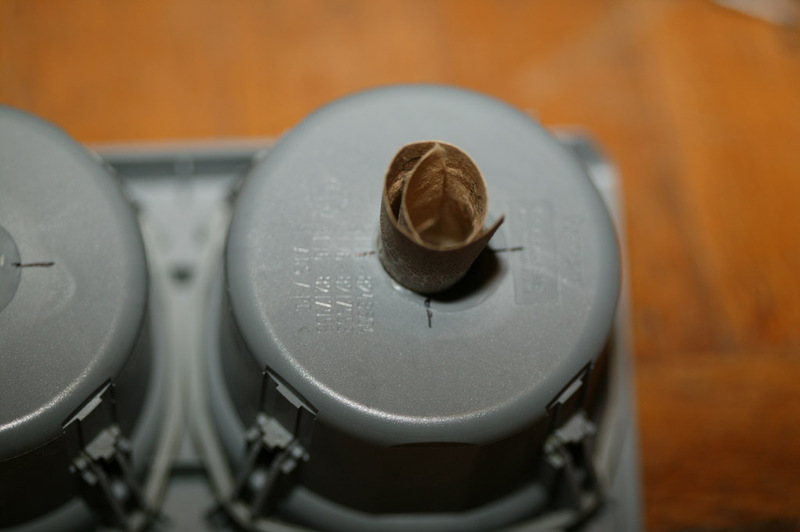 Thus, I decided to see if I could grind the top of the LED flat to be flush with the bottom of the cupholder. I ordered several different brands of 20mm round LEDs to see if any of them could be modified in this manner. After some experimenting, I found one that would work. BMW cupholder insert (gray, black, or sand to match your interior). I suggest purchasing a new one so you can revert to the unmodified one if you ever decide to. Part numbers: 51 16 8 217 953 (black), 51 16 8 217 955 (beige), and 51 16 7 248 504 (gray). Lite-On LTJ-811HR 20mm red LED. Available from Digi-Key. You'll need at least two, but since you'll be modifying these I suggest you purchase some extras. 20mm chassis punch. If you are in the majority of the world that uses metric measurements, this is probably easy to obtain. 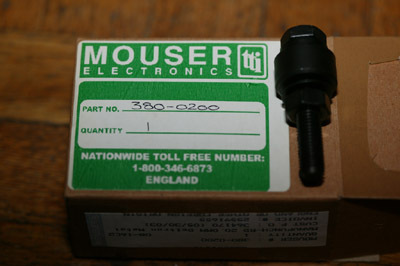 In the US, I had to order it from Mouser Electronics and it took 3 months to get here. Don't be tempted to substitute the closest matching fractional punch - spacing is critical here. UPDATE 2009-07-02 - Mouser now shows the 380-0200 punch as a regularly stocked item. Two 1K Ohm, 1/2 Watt resistors (Radio Shack 271-1118 or equivalent). Some sort of adhesive to attach the LEDs to the cupholder. I used PVC cement as used on Schedule 40 PVC tubing, as I had it around. 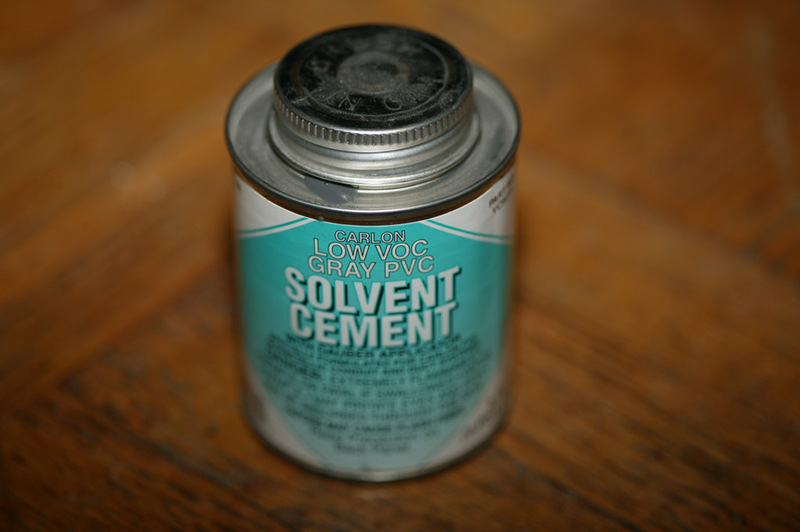 However, any solvent-based cement capable of making a watertight seal will work fine. Dremel or similar tool with large cut-off wheel. I used the Dremel 426 cut-off wheel and the Dremel 402 mandrel. Drill with assorted sizes of drill bits. Low-power fine-tip soldering iron and fine solder. Wire cutters or diagonal cutters. Small-gauge (#24 or so) stranded hookup wire in red and black. Electrical tape or heat shrink tubing and heat gun. Assembly instructions with pictures follow. Take your time and use protective equipment whenever you are cutting, grinding, sanding, glueing, or soldering. You'll need to let the glue harden overnight, so plan on this being a multi-day project. Here you can see the bottom of an unmodified BMW E46 cupholder. 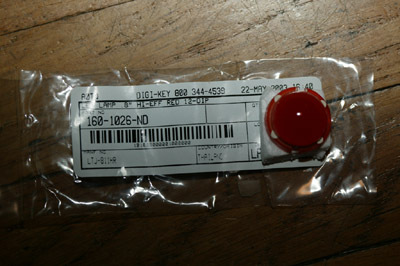 This is the red LED as delivered from Digi-Key. Note the large dome which we will need to remove. The formerly nearly-impossible-to-obtain 20mm chassis punch. 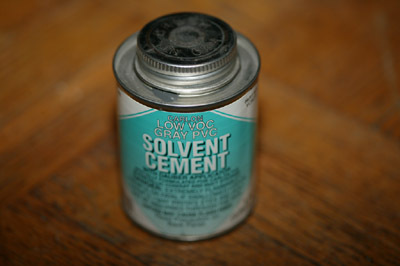 PVC solvent cement from the local Home Depot. Note that this is for the gray PVC pipe and is a single can which contains solvent and dissolved gray PVC. There is also a 2-part cement used for white pipe, which has a can of purple cleaner and a can of clear glue. We don't want that for this project. The plastic of the cupholders is actually ABS, not PVC. But the solvent in the PVC cement will get a grip on both the ABS of the cupholder as well as the LED, and the dissolved PVC in the cement will "bulk up" the glued area. You need to find the center of each cup by measuring across the holder. The plastic molding nibs are not in the centers of the cups, so you can't depend on those for centering. Place the tape measure or ruler at the widest point of the cup and measure across to find the center position. Mark this point with a dot using your marker, then rotate the holder 90 degrees and repeat. Once you have found the center, draw a pair of lines to mark the center as shown in this picture. Disassemble the chassis punch to remove the threaded stud. Select a drill bit slightly larger than the stud (you'll be drilling a hole in the cupholder that the stud will be threaded through) and place that bit in your drill. 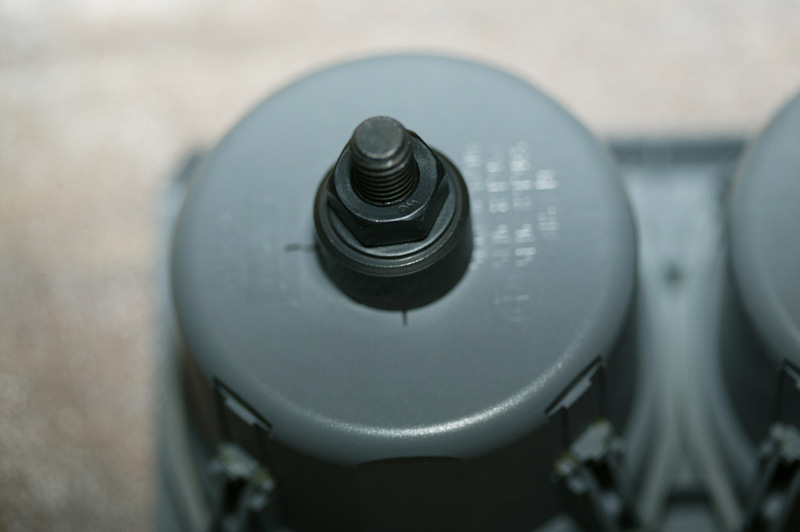 Before drilling the holes in the cupholder, you might want to snip off or sand down the plastic molding nibs on the cupholder - otherwise your drill bit will tend to "walk" off-center, which will lead to your LED being off-center later on if not corrected. Carefully drill a hole in each of the cupholder cups. Be careful to not damage whatever work surface the cupholder is on with the drill bit once the bit punches through the plastic! Per the instructions that come with the punch, assemble the punch in one of the pilot holes you've drilled in the cupholder. Depending on the type of punch, it may be better to position the cutting face on either the inside or the outside of the cupholder. 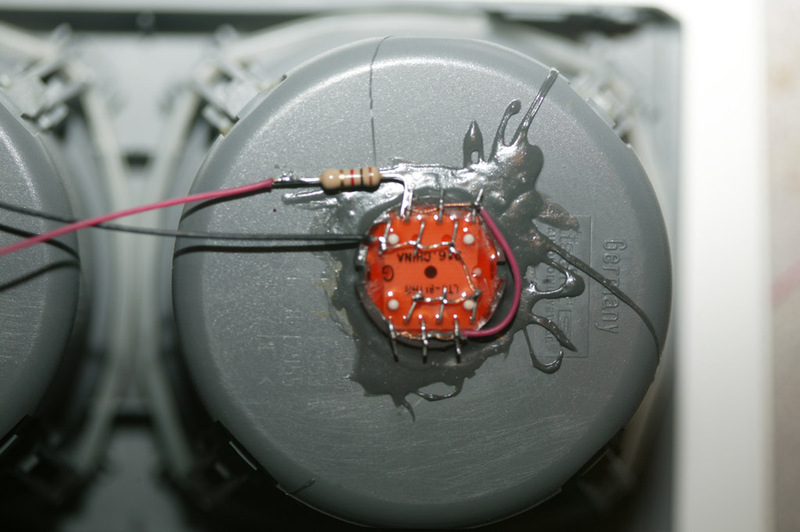 In the case of the Mouser punch I used, it is better to put the cutting (smaller) face on the inside. After looking at the alignment of the punch in relation to the center lines you drew in a previous step (adjust the punch location if necessary), carefully start to tighten the nut on the punch's threaded stud. It should not take much force to punch through the plastic - this punch is designed for metal. You may have to use a nutdriver or socket on the head of the threaded stud (inside the cup) to keep the whole punch assembly from spinning instead of cutting. Disassemble the punch and remove the plastic "slug" that was punched out of the cupholder. Repeat this process on the other cup. 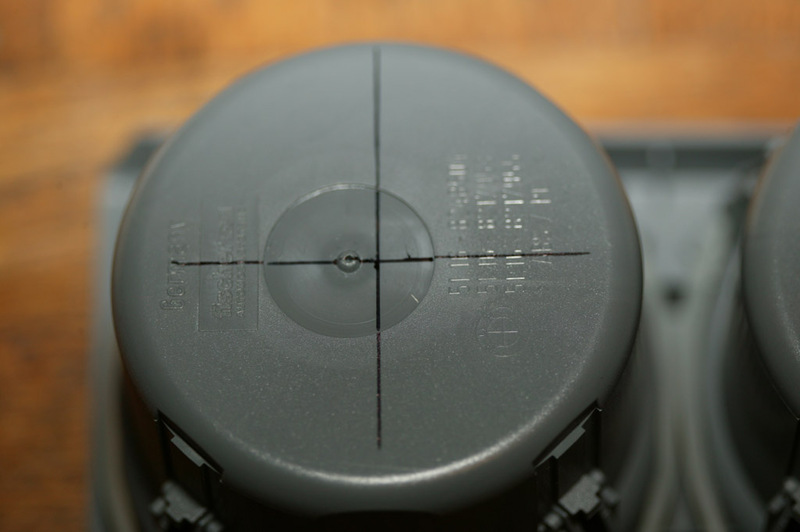 If your pilot hole in the previous step was off-center, you can enlarge the pilot hole with a larger drill bit. This will give you some "slop" to move the chassis punch around to the true center of the cupholder. The next step is to perform the initial trimming of the LED face. 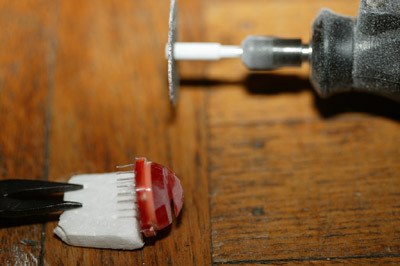 Use the Dremel tool and cut-off wheel to cut off the top part of the LED's dome. 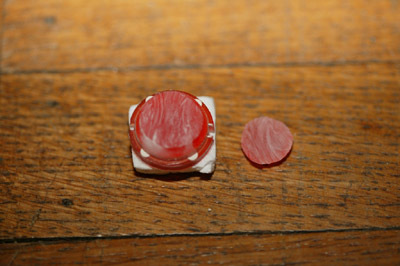 You want to remove enough material so that you don't spend hours sanding the LED down. Try to make these cuts as straight as possible. You should wear safety goggles during this step. A respirator is also a good idea as you'll be generating lots of fine plastic dust, as you can see on the LED in this picture. Note that some LEDs might have circuitry in the part of the plastic we are cutting off - one of the reasons I selected the particular part I used was that all the circuitry was lower in the LED. If you use a different part, be careful that you don't cut into anything besides plastic. Aside from ruining the LED, this could cause the Dremel cut-off wheel to break and/or parts to go flying, with attendant risk of personal injury or property damage. Here you can see the LED after the initial Dremel trimming has been completed. You can see the top of the LED off to the side. 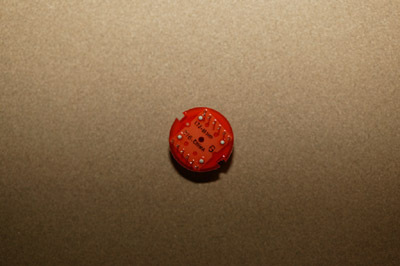 Place the LED face-down on a piece of 150 grit sandpaper and proceed to remove more material by moving the LED in a figure-8 pattern on the sandpaper. We have three goals here - to remove any rough cuts left by the Dremel, to make the top level (in case the original Dremel cuts were crooked), and to remove enough material that the LED will be approximately flush with the inside bottom of the cupholder when inserted from the outside. Just get to the approximate thickness needed at this point - we'll do the final adjustments in a subsequent step. Test the fit of the LED in the cupholder by inserting it from the outside bottom of the cupholder. You will probably find that it doesn't seat all the way due to the hole in the cupholder being slightly too small. In this case, use a piece of the sandpaper, wrapped around your finger, to carefully enlarge the hole in the cupholder. 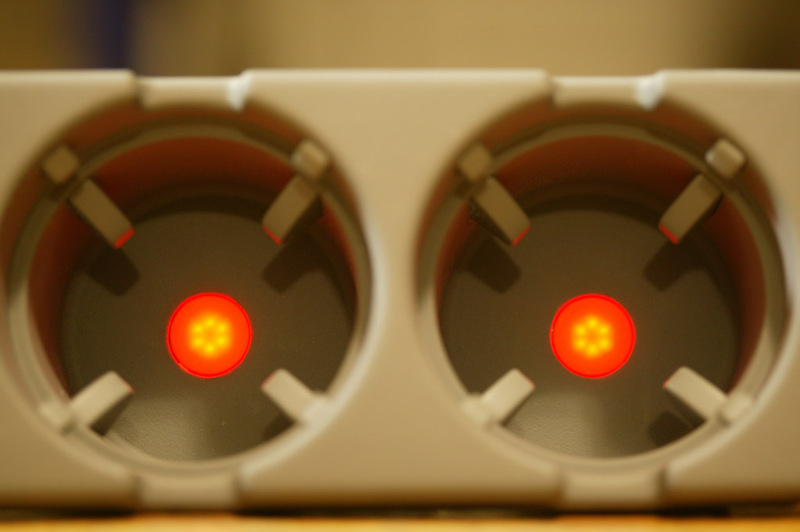 You don't want the LEDs to be loose in the holes - your want them to be held snugly. At this point should use your fingers to feel along the inside of the cupholder to see how far the LEDs are protruding. If they stick out more than about 1/16 of an inch, repeat the step of sanding the LED to reduce the amount of protrusion. Repeat as needed. 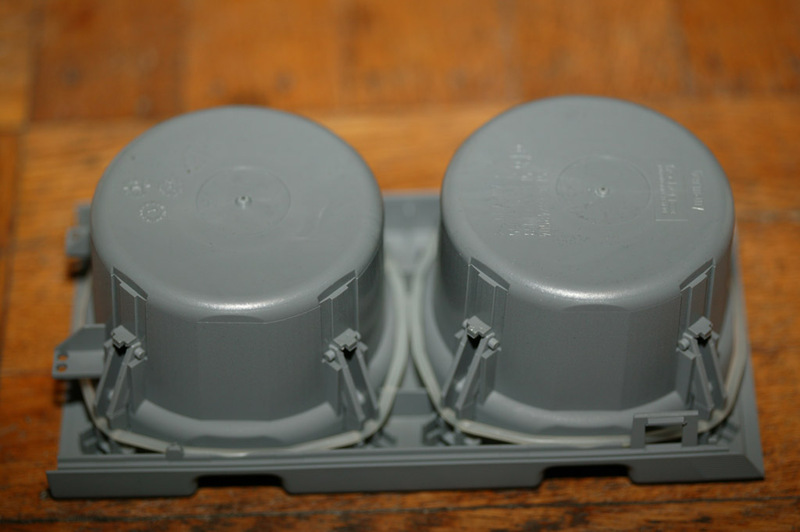 Note that the two sections of the cupholder may have different thicknesses of plastic, so keep track of which LED is going in which section of the cupholder. Remove any dust from the inside and outside of the cupholder as well as the hole in the cupholder, using a paper towel or tissue. 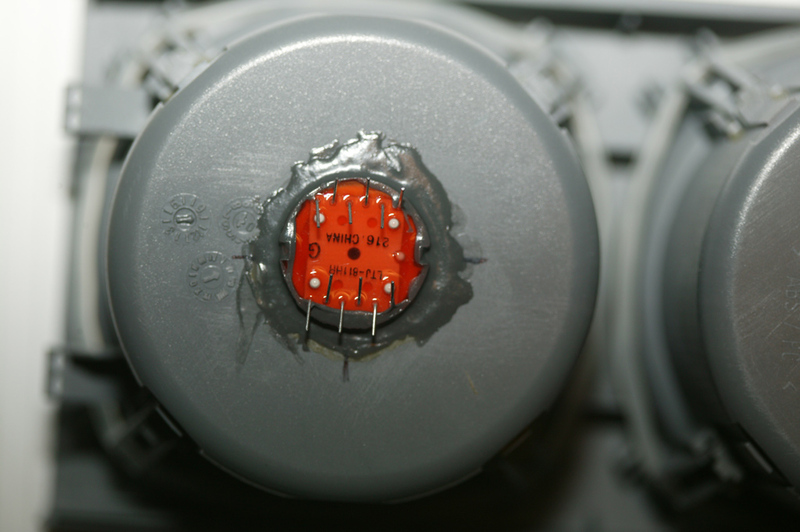 Also carefully clean the LED, paying particular attention to the flange/lip area. This dust can interfere with the glue we'll be using in the next step. 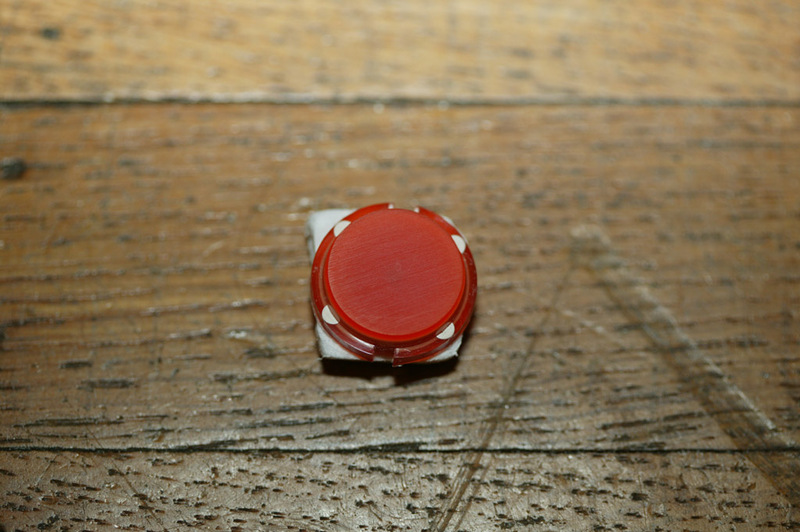 Here you can see the completed LED. 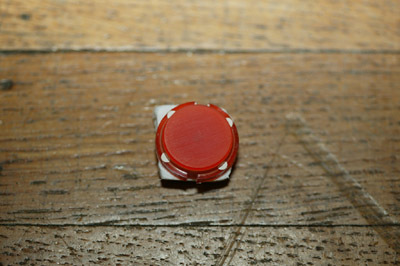 In addition to sanding, it has been lightly polished by rubbing it on a piece of cloth (my T-shirt, if you must know). We don't want to polish it too much - since we took off most of the thickness of the LED, we need a scuffed-up surface to diffuse the light from the individual LED elements in the base of the LED assembly. Now you're ready to glue the LEDs to the cupholder. Position the two LEDs in the holes of the cupholder and rotate them so the two rows of wire leads on the LEDs both run lengthways down the cupholder, as shown in this picture. Orient the LEDs so the letter "G" printing points toward the rear of the cupholder (where the two tabs that join the cupholder to the change holder are, seen at the left edge of the cupholder in this picture). After one last check to make sure everything is lined up properly and there isn't excessive LED protrusion into the bottom of the cupholders, proceed to glue the LEDs in place with the PVC cement or similar adhesive. You want to get a nice, continuous bead around the edge of the LED. Remember, any gaps here could let liquids leak into your center console area! I used a small coffee stirrer stick to place the adhesive - the dauber sponge that comes with the adhesive is definitely too big! Note that the brown mark on the bottom of the photograph is from an earlier attempt with a different adhesive that didn't work out. Let the cupholder sit in this position overnight to allow the PVC glue to harden - you don't want the LEDs falling out in the following steps! This picture shows the inside of the cupholder. 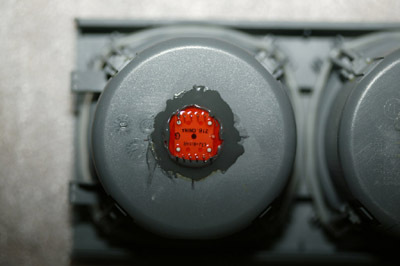 If you were careful while glueing the LEDs in place, there shouldn't be any glue or other residue inside the cupholders. Now we will start to wire up the LEDs. 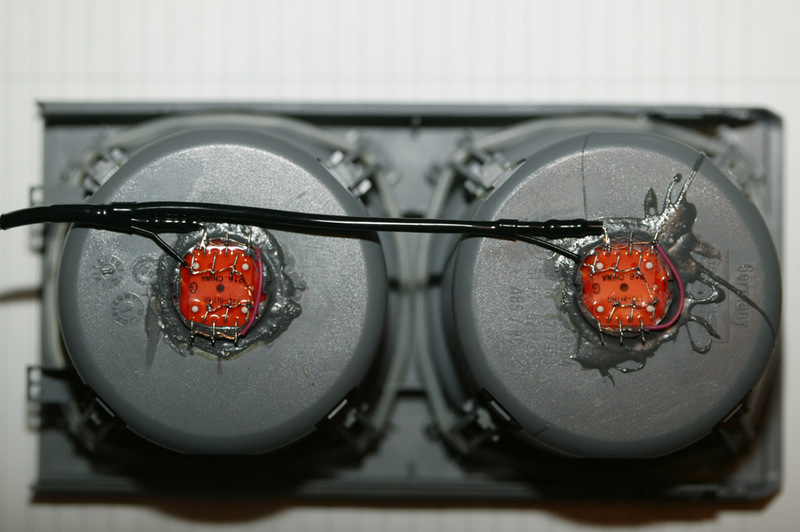 First, you should carefully bend over each of the 12 wire leads on each of the LEDs. 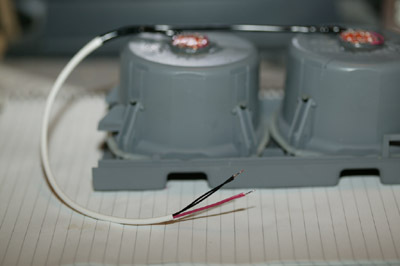 Follow this picture carefully - this is very important for a subsequent step of soldering wires to the LED pins. You can't just pick pins at random - the LED won't work and you may damage it. In this step, you don't want to bend the pins all the way down, but more like a 45 degree angle, as shown in the next picture. The wire leads are somewhat fragile, so be careful and work slowly - if you snap one off, you'll need to remove the LED from the cupholder and start over! If you have an extra LED, you might want to practice on it to get a feel for this and subsequent steps before working on the ones you've attached to the cupholder. Here is a side view to expand on my description of the previous picture. The idea is that you want enough work space to be able to wrap wire around each of the pins in a subsequent step, and if you bend them all the way down you won't have enough room. Before we start soldering, I should mention that aside from over-voltage, overheating during soldering is the main cause of early LED failure. You want to use as little heat as possible for as short a time as possible - just enough to get the job done. This illustration shows the front cupholder (the top of the holder has the beveled edge, and the cup insert itself is labeled "Germany"). 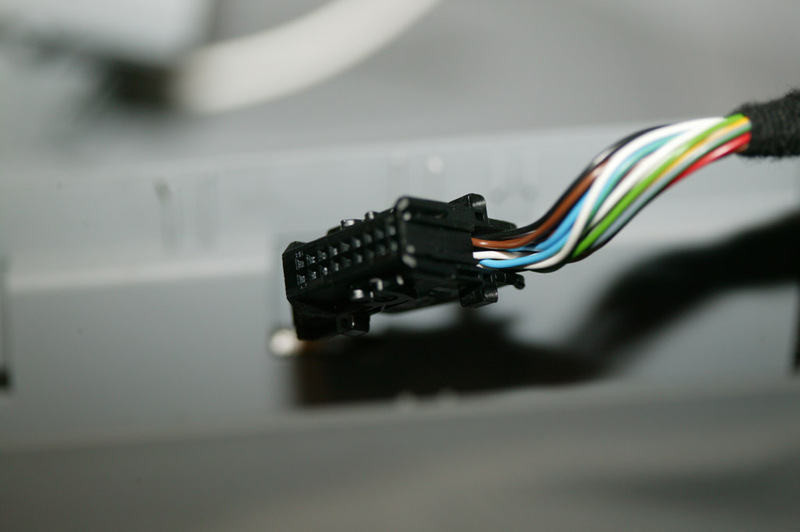 We will be routing the wires so they lead toward the rear of the car when installed. 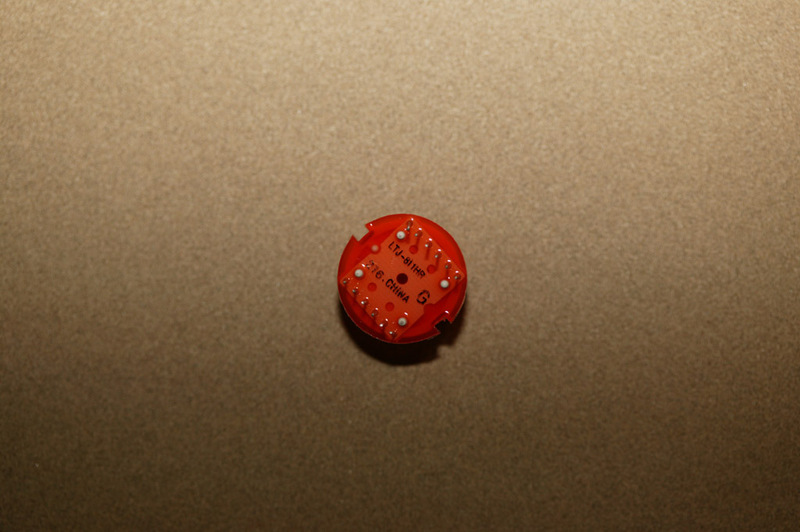 Now you will need to solder wires to each of the twelve pins of each LED, in two sets of 6. Take your time and work carefully here. Cut a 16" piece of black hookup wire and strip about 2.5" of insulation from one end. Starting at the pin bent inward nearest the "G" printing on the LED, wrap the wire around the pin for one turn. Tack it down with some solder. Now, take the free bare end of the wire and loop it around the next inward facing pin. Repeat for the last inward facing pin on this row. Tack these both down with solder. Now run the bare end of the wire across the bottom of the LED to the closest inward-facing pin on the other row of pins. Tack it down with solder. Repeat for the next (and last) two inward-facing pins. Cut off any excess bare wire from the last pin. Take a 5" piece of red hookup wire and strip 2" of insulation from each end. This will leave you with a piece of bare wire with 1" of insulation in the middle. Starting at the outward facing pin closest to the "LT" printing on the LED, wrap the wire around the pin for one turn and tack it down with solder. Repeat for the next two outward facing pins, working your way toward the "G" lettering on the LED. Repeat this process for the other side of the LED. Take a 1/2 Watt 1K Ohm resistor and trim the leads with cutters so you have approximately 3/8" on one end and 1/2" on the other (it doesn't matter which end of the resistor is which). Bend a 90 degree angle in the middle of the 1/2" end of the resistor and tack it to the outward facing pin as shown in the picture. Solder a 14" piece of red wire to the other end of the resistor. Gently bend the LED pins flat against the bottom of the LED. Remember, they're somewhat fragile. Space is very cramped in the center console, particularly near the front cupholder. Repeat the entire process for the rear cup insert on the cupholder. I used heat shrink tubing and a heat gun to cover the resistors and strengthen the whole wire assembly. Before shrinking the tubing, I trimmed the wires to about 10" past the rear cupholder and used an 8" piece of non-shrink plastic tubing (shown in the next photograph) to cover and protect the wires. You could use electrical tape if you don't have any heat shrink tubing, or you could just leave it uncovered - the bottom of the center console is plastic, and there isn't much vibration there. BMW would use their "fuzzy tape", of course. I didn't bother covering the bottoms of the LEDs as I didn't want to make this any thicker than it already was. IMPORTANT NOTE: If you use a heat gun, make sure that the PVC cement or other adhesive has fully dried. It is highly flammable and you don't want your project to catch on fire! Also, the heat gun will tend to soften the plastic of the cupholders as well as bubble the PVC adhesive. Like soldering, the idea is to use as little heat as possible for as brief a time as possible to get the job done. Here you can see the completed cable assembly. 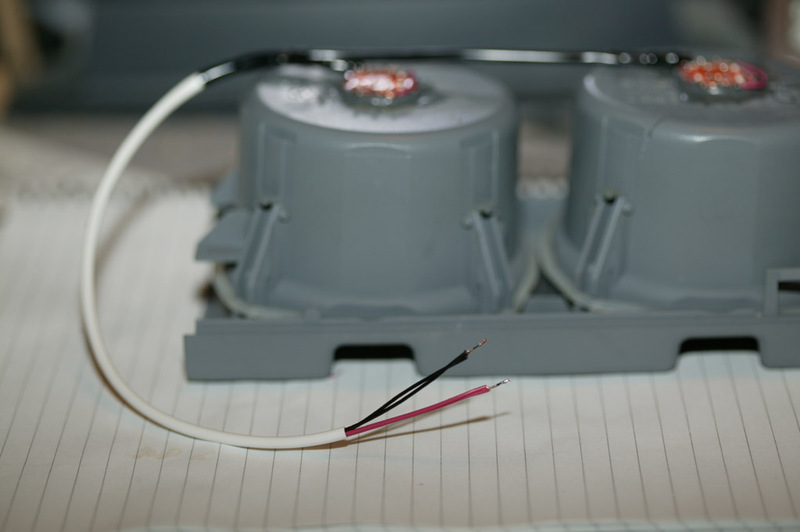 I stripped about 1/4" of the insulation from each of the 4 wires, then twisted the two red wires together and soldered them. Then I did the same for the two black wires. At this point, take a 9 Volt battery and apply power to the ends of the cable. Connect the red wire on the cable to the "+" terminal of the battery and the black wire to the "-" terminal. 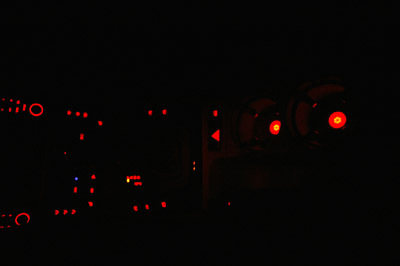 You should see 6 individual points of light from each LED, as shown in this picture. 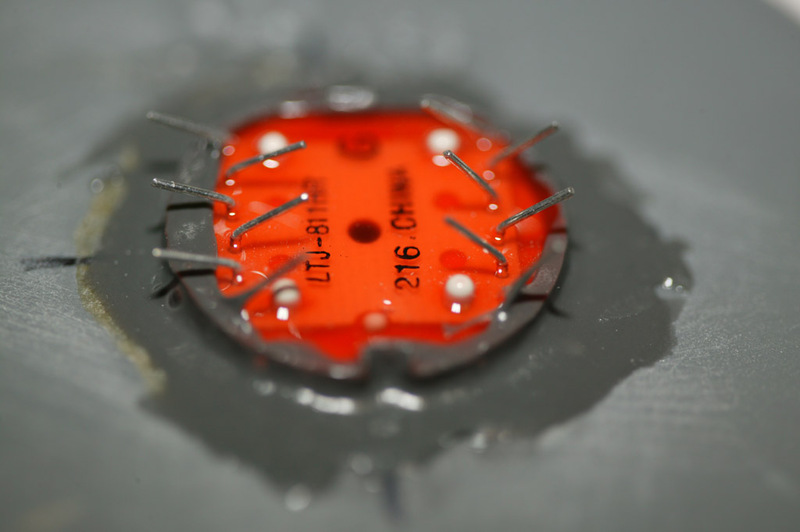 If you have less than 6 points of light on one or both LEDs, but at least one point is lit on each, check your solder connections - you may have a bad connection on one or more pins. If one or both LEDs is completely dark, you might have a dead battery, the "+" and "-" terminals reversed on the battery, a bad resistor, or some sort of other problem with your wiring. Note: Clicking on this image will open an Adobe Acrobat PDF file. There are a number of places in the car where we can pick up the variable voltage dimmed instrument lighting signal. On first examination, the hazard and central locking switch assembly would appear to be the best. Unfortunately, it is separated from the cupholder area by the plastic of the center console housing. Fortunately, this signal is also available on the CPT8000 phone pre-wire harness, conveniently located in the cupholder area. If you look at connector X4545B (labeled "Connector in Console) you'll see ground on pin 17 and a signal labeled "KL58G" on pin 15 which doesn't appear to be connected to anything. That is incorrect - the car side of this pin is the dimmed instrument lighting signal, and if you have the CPT8000 phone eject box installed, the eject latch LED is wired to this signal. This picture shows the 18 pin connector on the CPT8000 adapter harness. It will be in the center console area, though you may have to fish it out. If you don't see it after removing the cupholders and change dispenser, look toward the rear inside the console, underneath the armrest hinge. If you see a pair of wire bundles with braided jackets, that is the harness. A skinny single wire is the cell phone antenna, which we aren't interested in. 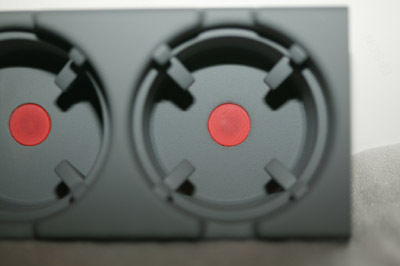 You will see that the connector has numbers in each corner: 1, 9, 10, and 18. Those are the pin numbers. 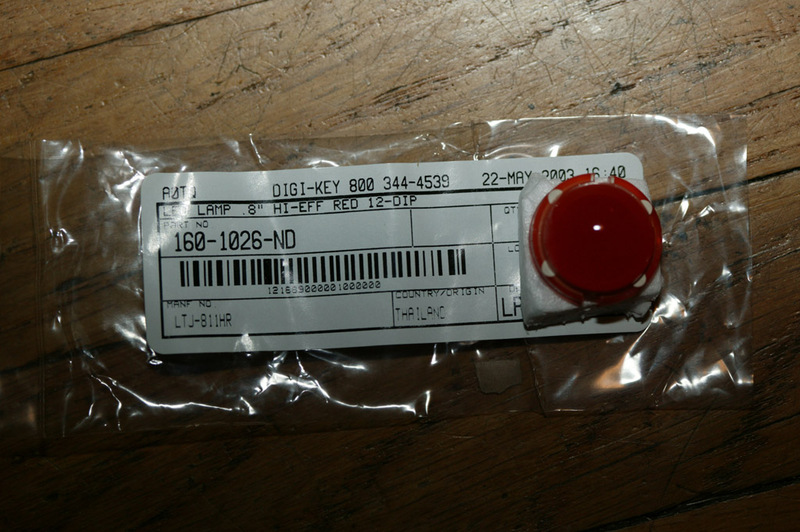 As mentioned above, we want pin 15 for our red wire and pin 17 for our black wire. NOTE: This is the pinout on the CPT8000 adapter harness. 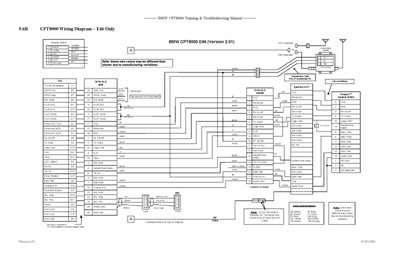 The actual pinout on a car without a CPT8000 adapter harness will likely be different. 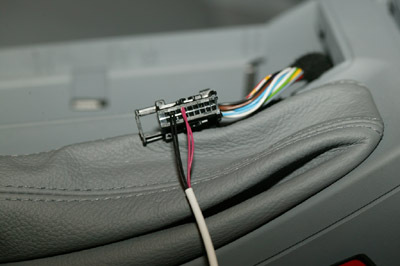 On my 09/2002 production car, the black cupholder wire goes to pin 2 of the car harness and the red cupholder wire goes to pin 3 of the car harness. I've had reports from a number of users quoting various pin numbers - apparently BMW has changed the pinout around multiple times. Update: The first 2 parts listed above don't seem to be available from BMW dealers - I suspect they're manufacturing-only part numbers as neither US dealers nor German dealers can order them. You could purchase the Bluetooth pairing button adapter cable, 84 11 0 302 181, from the dealer and then re-use those parts for this project. Using whatever method you choose, hook up the cupholder wire and proceed to test the LEDs. 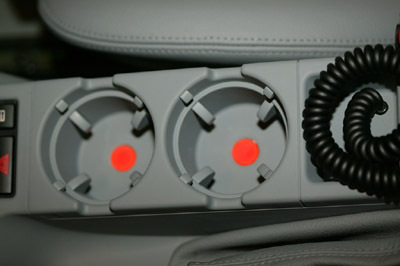 With the vehicle parking lights on, the cupholder should illuminate and the intensity should increase and decrease as the dimmer on the light control is turned. 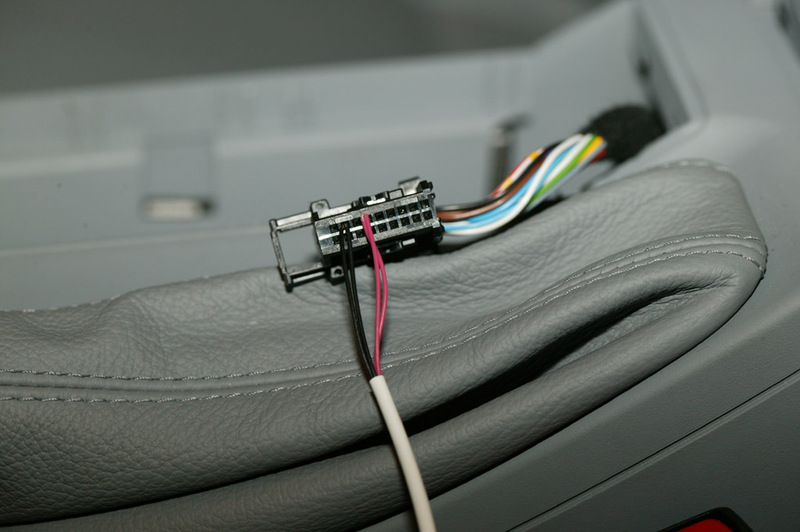 If you find that the LEDs are too bright in comparison with the other interior lights, you can add an additional resistor between the red wire of the cupholder cable and pin 15 of the phone connector. I'd suggest starting with a 1/2 Watt 220 Ohm resistor and working up from there (higher resistance - bigger Ohm numbers - will reduce the intensity of the LEDs). Other common choices are 330, 470, and 680 Ohms. All of these should be available from Radio Shack. In this view, the cupholder and change holder have been re-installed in the center console. Make sure that the cables from the cupholder aren't pinched. If you were careful and bent the LED pins down as flat as they can go, you shouldn't have any clearance problems. If the cupholder doesn't seat all the way, make sure that the cable is off to the side of the LED and not directly beneath it. If you have any clearance issues, they are likely to be with the front cupholder as that is where clearance is the tightest. Note that the actual appearance is a bit more subtle - the armrest is usually down and you won't be staring at them head-on through the moonroof. Also, the coiled cord is part of my custom CPT8000 phone install - normally there wouldn't be a cord here and you'd have the oddments tray or the coin holder here. 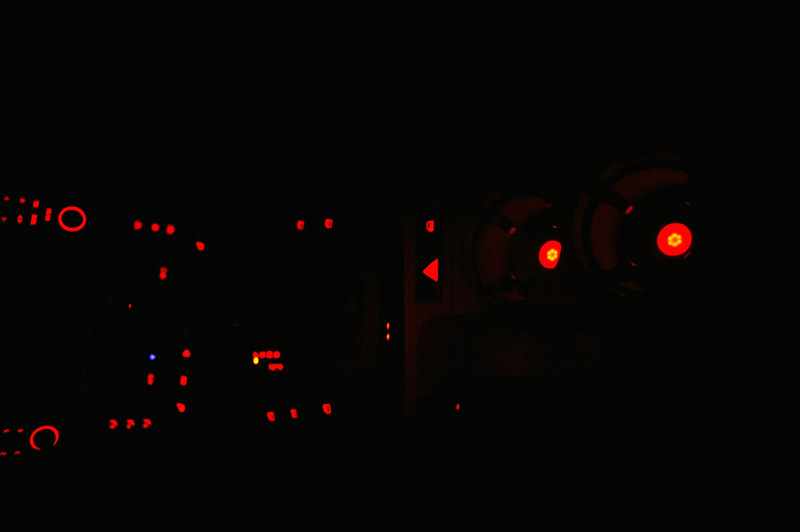 Here we can see what the project is all about - the cupholders are lit up with a nice reddish-amber glow. Enjoy! A number of people have asked me for pictures of the car interior at night, to see how well these lights match the rest of the interior lighting. This and the next picture are my attempt to provide those pictures. It is quite hard to get a good picture at these lighting levels. This picture is a close-up of the cupholder part. 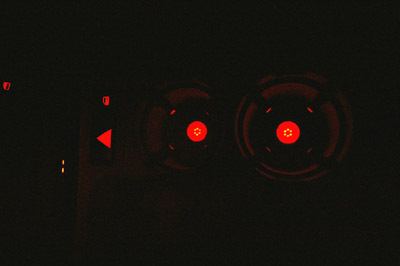 You can see some of the reflected glow of the LEDs in the rest of the cupholder insert. Accessibility Policy This page last modified on Tuesday, 02-Jul-2013 07:18:56 EDT. So, what's a glaver anyway? 9 hits this week, 127967 since 9/19/2003.